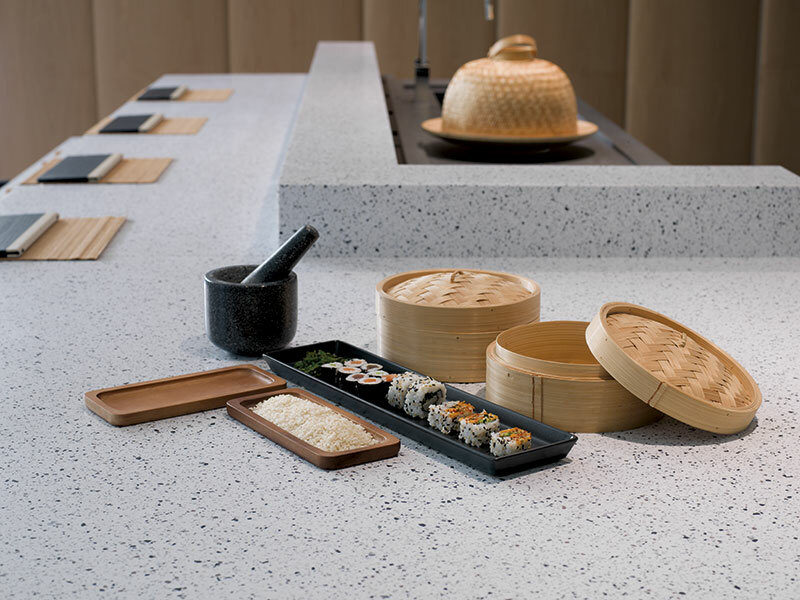 The creation of unlimited surfaces with imperceptible joints is one of the revolutionary properties of the KRIONTM Solid Surface, which is capable of improving the quality of life for people. KRION™ is a homogenous material in a non-porous mass suitable for creating large surfaces without joints, and due to its thermoformable property, it has the versatility to both transform and adapt to any design, as if it were a single piece. This is undoubtedly one of KRION™‘s biggest advantages, not only because of its aesthetic and creative possibilities, but also because of its functional and technical superiority over other materials, since they are the ideal option for installation in spaces which require extreme levels of asepsis. In atmospheres where neatness and health conditions are the priority due to their high impact on people's safety, such as sanitary and food spaces, it is key to maintain greater hygienic awareness. With traditional materials, it is usual that over time that humidity and the filtration of liquids and dirt in the joints are generated on the surfaces. This negatively affects: the spaces aesthetic and also health. As well as that, inadequate cleaning of the surfaces leads to the proliferation of bacteria, mold and other microorganisms. That is why operating and treatment rooms in hospitals, laboratories, dental clinics and pharmacies around the world have already joined the KRION™ revolution. The absence of joints makes maximum hygiene in spaces and practically zero maintenance easier, encouraging the building of healthy and beneficial atmospheres for the welfare and comfort of people. Together with the possibility of creating surfaces without joints, another of the most interesting properties of this material is its bactericidal action. The high material handling capacity allows for unlimited shapes to be introduced. In order to maximize the creative possibilities, KRIONTM has developed, in addition to the sheets, semi-finished high-performance solutions. This is the case with K-FUSION, a solution which allows the sheets to be joined with complementary casting pieces by way of invisible joints which achieve continuous compositions, due to the use of material transformation techniques. Countertops and bowls without joints, basins, bathtubs and built-in shower trays; wall tiles which are extended infinitely take on the shape of the furniture, including custom-made designs for counters or contract exhibitors. The sheet joints and cast pieces are done with adhesive kits, suitable for contact with food (NSF-51 certification) and low emissions of volatile organic compounds (GREENGUARD GOLD certification). These adhesives are formulated to provide aesthetic and mechanical continuity, with a tensile strength resistance superior to 14 MPa that guarantees the quality in the different installations. Cut, thermoform and join with invisible joints. A material with high technical and functional features, which is perfect for unlimited ideas. This cutting-edge material meets all the requirements and quality standards that the ISO 9001 and ISO 14001 standards demand. In addition, its exclusive properties, such as the absence of pores, its resistance or its bactericidal action, have been certified by tests carried out under the ASTM G21 and UNE-EN ISO 846 standards in independent institutions with international prestige, which certify that both fungi and bacteria do not find a way to find a home on its surface. With regular cleaning, the surface is free from any type of infectious element. The particularities of KRIONTM are also respectful towards the environment; it is not toxic, since it passes the tests of the REACH standard; it is free of Bisphenol A and practically fireproof with the European B s1 d0 classification, according to the UNEEN 13501-1 standard. Thanks to the innovative K-EASTTM technology developed by Krion Porcelanosa Grupo, K-LIFETM has been created, a dynamic material that inherits the intrinsic properties from KRIONTM, in addition to other new qualities like being capable of purify the air through the photocatalysis, since: when the material is in contact with any type of ultraviolet light, its properties are activated and a chemical reaction occurs degrading gases and harmful emissions, thus turning them into harmless products such as mineral salts and water which enhance the quality of people’s lives in the process. As well as that, K-Life prevents the proliferation and elimination of bacteria without any type of: additive, hardness, resistance, durability, chemical products elimination, ease of repair, low maintenance and easy cleaning. This revolutionary progress in the ceramic sector has been awarded with international awards, such as: the "Muuuz International Awards (MIAW)" in the "Materials" category in Paris, or the "Outstanding" award from the Spanish newspapers: Expansión and El Mundo in the "Sustainability" category in Barcelona. The commitment to quality and passion for innovation means that day after day, the world of possibilities offered by KRIONTM keep on improving people’s welfare and comfort.